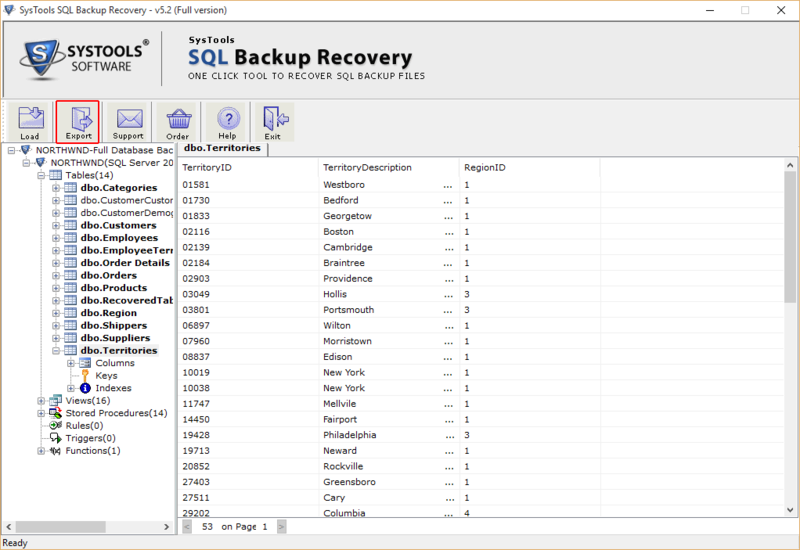 SQL backup recovery tool allows to recover entire data from multiple SQL backup files. Various components are recovered which includes- Tables, views, store procedures, rules, triggers, functions, keys, columns, Indexes etc. The customer can also preview the data within the above-mentioned components with the help of in-built viewer of the SQL BAK file recovery software. 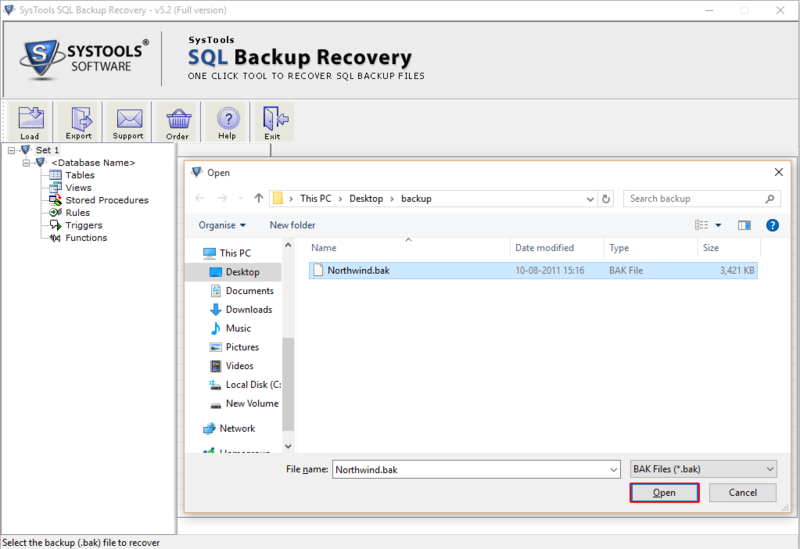 As soon, the corrupt SQL BAK file is recovered, SQL backup repair tool loads all the items, associated data to the backup file and generates preview of it. This makes user to preview complete data inside the component like tables, view, store procedures, rules, triggers, functions, keys, columns, indexes etc. Other database files such as MDF and LDF(log file) of SQL server may also be present in the SQL backup file. During backup recovery, SQL backup recovery tool recovers all the files saved in the backup such as MDF and LDF file. The SQL BAK file recovery software software keeps all the details and data unharmed without any loss. 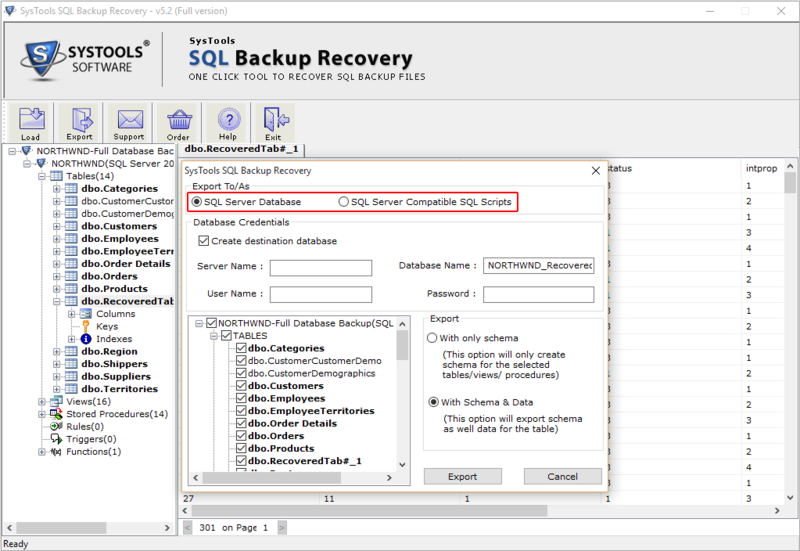 SQL backup recovery tool offers support to all the elements of the database along with the keys. While recovering database from the SQL .bak file, both Primary as well as Foreign keys are supported to recover corrupt SQL backup file. With Schema only: With the help of this option only schema of table, views or procedures is created. With Schema and Data: By using this option, the user will be able to export both schema as well as data of the selected table views and procedure. SQL Server Database: The user can export the data directly into SQL Server database. Here the user need to provide complete details of his/her SQL Server account. SQL Server Compatible SQL scripts: Here, the user can create an SQL script file; which can further be restored on SQL server. The user can check the tables, triggers, procedures or views and export only selected items. 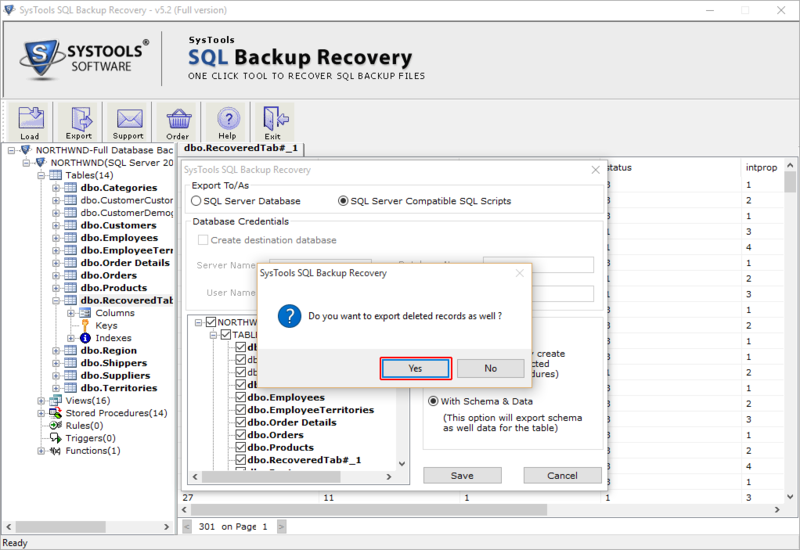 The SQL BAK file recovery tool allows performing batch export of data from SQL .bak file to the desirable format. The originality of data while exporting and saving the file is also maintained. The software do not have any file size limitations to restore and recover corrupt SQL backup file data. The SQL Server BAK File Repair Tool can restore any size of data and also supports various versions of SQL server such as 2014, 2012, 2008 and all below versions. If the user is using Windows 10/8.1/8/7 or Vista, then the user has to launch the tool as "Run as Administrator". For repair corrupt SQL .bak file, is there the need of MS SQL server? 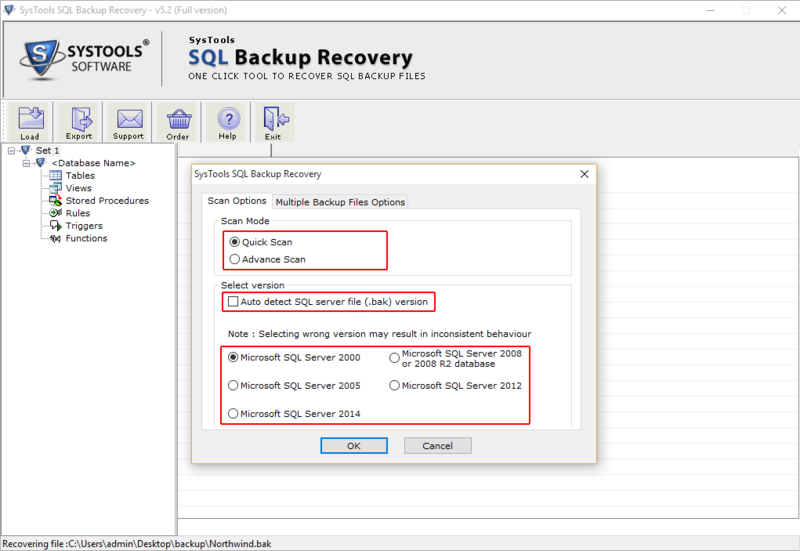 No, the SQL backup repair tool will perform recovery of corrupt .BAK files even without installation of SQL Server. Further if you want to export recovered SQL items in SQL Server then SQL Server should be installed on machine and you must have proper admin rights for export. Is there any size limitation of the SQL .bak file? 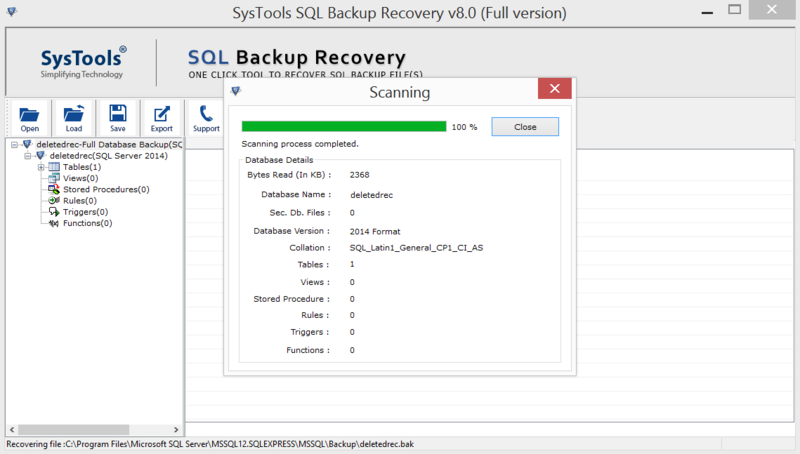 No, the SQL BAK file recovery software can recover corrupt SQL backup file of any size. What is the difference between ‘Demo’ and ‘Full version’ of the software? The 'Demo' version of the software shows the preview of all repaired Information in the corrupt SQL backup files; while, to export it, the user need to buy ‘Full’ version of the software. How much time does the SQL backup repair tool take to repair damaged file? 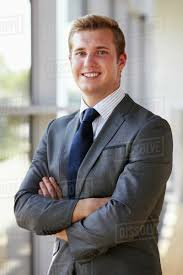 Repairing corrupt file depends directly upon the size of the selected file and the level of corruption the file is having. What is the validity of software license? 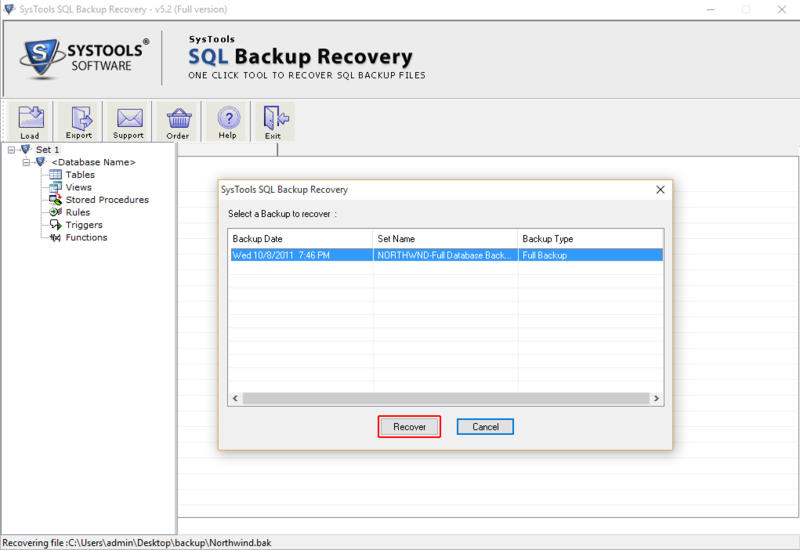 The license key of SQL backup recovery tool is valid for lifetime. Can the software be installed on multiple systems? Yes, Yes, SQL BAK file recovery software can be installed on multiple systems to fix the corrupt SQL backup. I am completely satisfied with the performance of the SQL backup recovery tool. It is an outstanding tool that helped me to easily repair corrupt SQL BAK files without any data loss. I have corrupt SQL backup files of about 18 GB and worried about recovery of them. 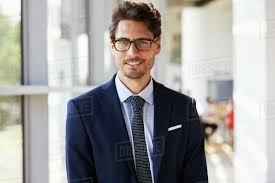 But thanks to this SQL BAK file recovery software that provides me complete recovery of .bak files of such huge size without any sort of complications. All the data recovered are accurate and complete and no data loss is there, keep it up guys! The best way of repairing BAK file. All in all, the SQL backup recovery tool offers a proven SQL backup file recovery solution at a competitive price. Also, the software ensures that the recovery process is not complicated. Step 1: Load SQL backup File- Clicking Load button from software will load and initialize scanning process of the SQL BAK file. Step 2: Select the scanning mode in order to repair SQL backup file based on the level of corruption of the file. 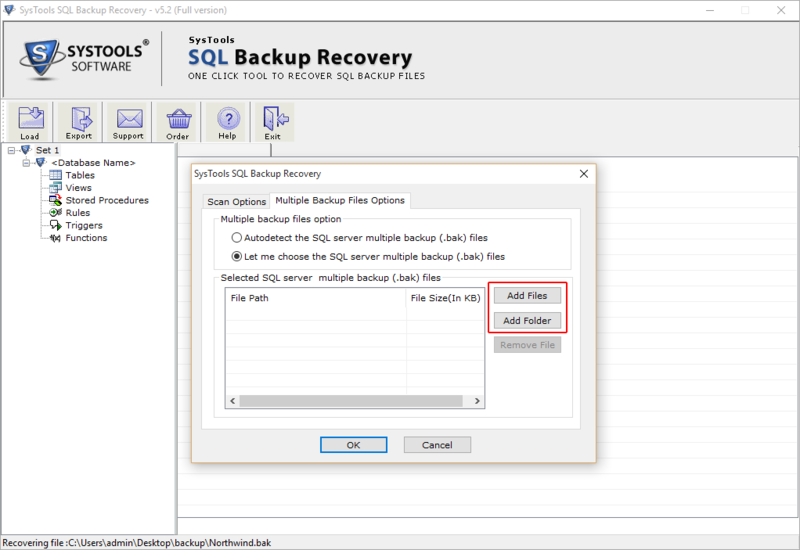 Step 3: In order to add multiple SQL backup file, click on the Multiple Backup Files Option which allows autodetect or manual selection of SQL BAK files. 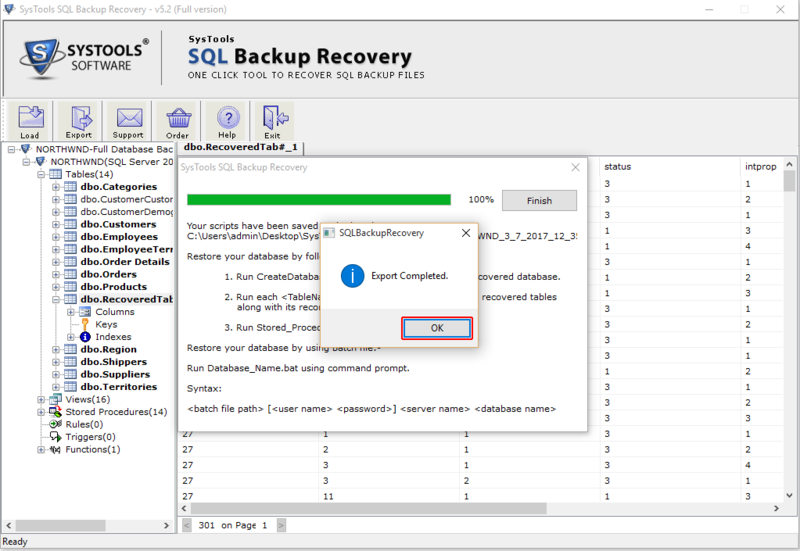 Step 4: After the selection of SQL backup FIle(s), click Recover to initiate the recovery process. Step 5: As soon as scanning process of corrupt SQL backup is complete the SQL backup repair tool shows complete details of files recovered. Step 6: The software displays complete preview of the recovered items and then click Export button to export the repaired items. Step 7: Further, a display window indicating multiple Export To options is displayed. Step 8: Then, credentials are needed in order to export directly to SQL Server Database and after the authentication, select the required items to export. Step 9: Provide the Destination location where .sql files would saved and track the export process provided by the tool.